Greetings to all my cherished video programmers, it’s Andy Gesner and the indefatigable staff from HIP Video Promo, here with a clever new clip from an arresting combo from Chicago . Like many people who take the business of music seriously, we’ll be down in Austin in a week with open eyes, taking in the new talent at SXSW. Who will be the talk of the festival in 2009? Time will tell, but we think Sybris is as good a bet as any band to leave the Texas capital buzzing. For starters, they’ll be arriving in Austin with a head of steam: their relentless gigging schedule puts them in Texas during another of their storied swings through the Midwest . Plus, they know the territory – the band’s wild, dynamic performance at last year’s Austin City Limits festival is still reverentially discussed on Sixth Street . But those who’d seen Sybris before weren’t surprised. Few rock bands are as reliably exciting in concert. They’re no slouches in the studio, either. 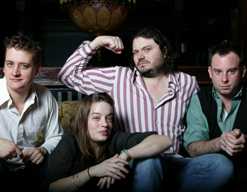 Into The Trees, their sophomore record, received ecstatic reviews upon its release and established the Windy City quartet as a band to watch. Jo-Anne Green of the All Music Guide calls the album “a deep forest of aural delights”, and praises Sybris for their sound, their energy, and their playful experimentation. Mars Simpson raves in Treblezine about Angela Mullenhour’s voice: the reviewer compares the Sybris frontwoman favorably to Karen O, Emily Haines of Metric, and Joanna Newsom. Her stinging guitar playing has also become a site of hipster admiration: Into The Trees is studded with razor-sharp six-string. “Oh Man!”, the latest single from Sybris, features Mullenhour and the band at their barbed-wire best. As many of the group’s songs do, “Oh Man!” bristles, ebbs, and flows, slowing down for a meditative middle section before exploding into a raucous coda. But as hard as they rock – and Sybris always does rock hard – the hooks are never disguised. We warn you right now: “Oh Man!” is likely to be one of the spikiest songs ever to get lodged in your head. Mark Bachara and Michael P. McGrath are well-known for their whimsical, relaxed, and compulsively watchable videos: they directed the lunatic house-party clip for Catfish Haven’s “Tell Me”. Their spot for “Oh Man!” is every bit as unpretentious and winning. Here, the members of Sybris plan and execute a jewel heist: Angela Mullenhour is, as you’d expect, the ringleader, but her bandmates get plenty of action, too. The directors capture the gang in their practice-room hideout and split the screen into smaller windows; it all looks a bit like the titles of a mid-Seventies private investigation drama. There’s safe-cracking, blueprint scribbling, casing, and a long, slo-mo ride past a jewelry store festooned with police tape. Someone has hit the target before the band had an opportunity to pull off the robbery! The expression on Mullenhour’s face – as she locks eyes with a cop – is absolutely priceless. Nevertheless, it doesn’t compare to her shock when she returns to the practice studio, and finds another (and stranger) surprise waiting there for Sybris! Here at HIP we are stoked to be working with Sybris and our friends at Absolutely Kosher Records to bring you this action packed clip we are sure will thrill your viewers. Hit us up if you would like to get copies of Into The Trees or set up video interviews with the band! If you need more info, call Andy Gesner at 732-613-1779 or e-mail us at info@hipvideopromo.com. You can also visit www.SybrisMusic.com to find out more about Sybris.